POINT LOOKOUT, MO. —The College of the Ozarks Orchestra will perform in the Newman Recital Hall on Wednesday, April 17, 2019, at 7:30 p.m. The concert is free and open to the public. Seating is first come, first served. The orchestra is directed by Luke Carlson, assistant professor of music. Phil Taylor was commissioned to compose an original work for the C of O Orchestra. “Quiet Music” is the result of that commission. 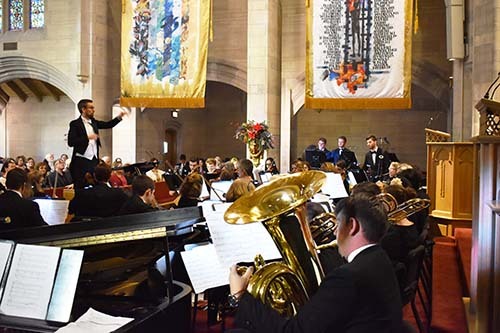 He earned his doctorate in composition from the University of Chicago and has been commissioned by or collaborated with numerous ensembles across the United States. He has been recognized by BMI with multiple awards, and his music has been featured at the Santa Fe Chamber Music Festival, Copland House Cultivate, the Aspen Music Festival, and Wellesley Composers Conference. “We are always excited to share our music with an audience and encourage all ages to come hear this fantastic collection of works,” Carlson said.